OAK BROOK, Ill. – For the first time, researchers have confirmed an association between a common magnetic resonance imaging (MRI) contrast agent and abnormalities on brain MRI, according to a new study published online in the journal Radiology. The new study raises the possibility that a toxic component of the contrast agent may remain in the body long after administration. MR images in 45-year-old woman with glioblastoma treated with surgery, chemotherapy,and radiation therapy. 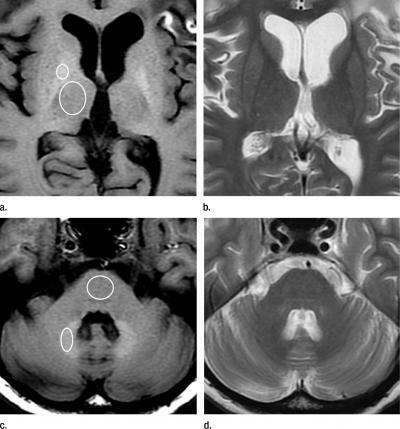 (a) Unenhanced T1-weighted image shows high-signal-intensity globus pallidus.Standard ROIs were placed around globus pallidus and thalamus. (b) Fast spin-echo T2-weightedimage at same level as a. (c) Unenhanced T1-weighted image shows high-signal-intensity dentatenucleus. Standard ROIs were placed around dentate nucleus and pons. (d) Fast spin-echo T2-weightedimage at same level as c.